At Onsite Detail we have handled many different kinds of messes in all different kinds of vehicles. Hard water spotting, tree sap, vomit, and pet messes are among the many kinds we have dealt with. But arguably one of our most common types of spills and stains come from a simple, yet common culprit- food! Our Interior Detail is the solution! As pristine as we try to keep our vehicles, we are only human, and humans need to eat and drink. Sometimes our need for sustenance comes when we are on the road, and something as simple as a bump in the road can make a mess of things. So in this article, we will be going over some of our favorite snacks and cuisines to clean up with our interior detail service! How about some beverages to start? It turns out having water is a cheap option in more ways than one! A common call we get is for interior details to focus on a drink gone wrong. Warm drinks like coffee and hot chocolate are especially common in the wintertime, since they are treats that warm us up and can get us ready for the day. However, it only takes one bump in the road or a drink carrier to collapse to make a treat a disaster. Both stain pretty easily as is, but it’s even less fun when it has creamer or any other dairy products. Dairy can smell bad when not chilled because it cultivates bacteria, and now that we’re (hopefully) reaching warmer weather, that’s going to be a more immediate effect. And let’s not forget our other dairy disasters like chocolate milk or baby formula! If coffee isn’t your drink of choice, we have also taken care of soda spills. The syrup and coloring in these drinks love to try and stain carpets and upholstery, and if it can’t stain, it’ll make things sticky and sugary, which is attractive to ants and other bugs. Dark sodas especially like to cause problems as their syrup discolors whatever they spill on, though clear sodas love to mislead by looking clean when they’re actually not! Be especially careful with canned sodas with the changing temperatures as they love to explode if left unopened and unattended in your vehicle. While this is not one of our common ones, some people have a fancier taste in beverages. Of course we mean wine or other alcoholic drinks. This last holiday season we got a call from a nice gentleman who had bought an expensive bottle of red wine which spilled all over the back of his car, leaving a bad stain and strong odor. 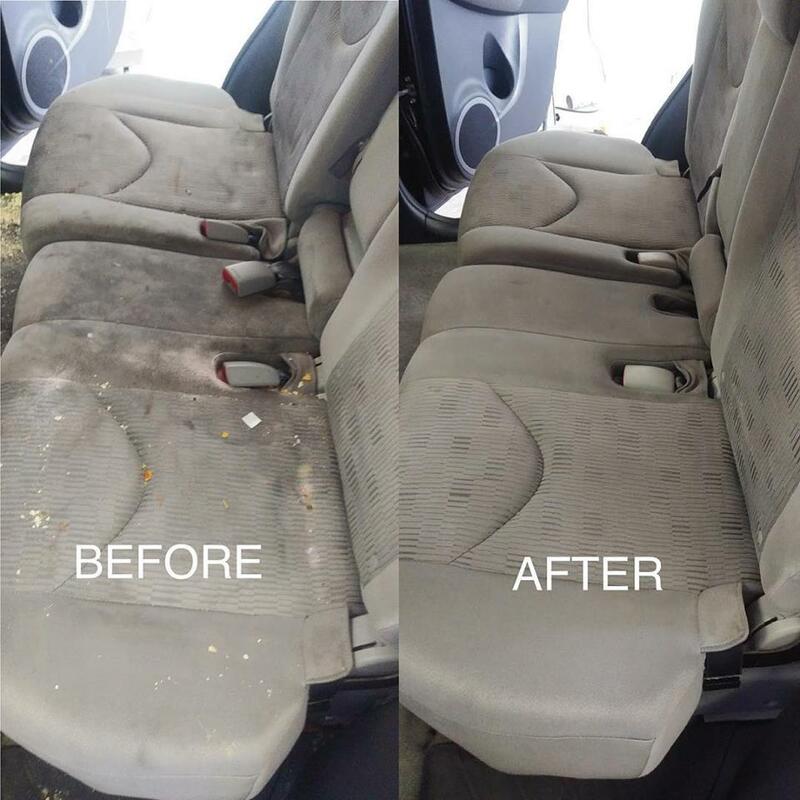 Thankfully he had called quickly and we got to do our interior detail on it right away, which saved his seats and carpets from red wine stains and nasty odor! Of course, drinks are not the only spills we manage. At Onsite Detail we have seen our fair share of food as well when we do our interior detail service! Fast food is a popular one we handle, for a variety of reasons. Whether you’re a fast food connoisseur or only indulge when you have five minutes of lunch break left, we know how it can affect our rides. Foods like tacos and burgers can cause spills from condiments of toppings like lettuce, and fries love to drop from our fingers into the crevices between and under the seats, never to be seen again. (At least, until we take care of them.) Not only that, but it’s easy to stuff the wrappers into the bags and promptly forget to remove them, which can leave a fast food smell in the car and make it look trashy. Thankfully our guys are experienced in cleaning all kinds of food, and we are professionals at cleaning fast food mess! But our expertise does not stop there. Recently we got to clean a vehicle where someone had accidentally spilled rice all over the back of the car, and over the holidays someone called asking if we could clean a spill from a pot roast that had tipped in the trunk of the car. We may not be able to recover the loss of good food, but we can help the grieving process by cleaning the mess after! Still have room for dessert? Great! As mentioned before, dairy is a bane for vehicles in hot weather. However, this doesn’t stop us from indulging in ice cream from time to time! Popsicle sticks, cone wraps, and sticky napkins join in the fun as well when it comes to our favorite summertime dessert. But what about sweets we can enjoy all year round? Candy and chocolate are especially fun for us to find, especially in vehicles where kids rule the car. We have gotten all kinds of candy, generic and brand names alike. Don’t be shy if you’re calling for some cleanup after a sugary incident, we are happy to take care of the details! Of course, not all desserts are sugar confections. One of our detailers a few years ago had a job to take care of a watermelon to enjoy in the summertime, but it was forgotten about… for a few weeks. It turns out the vehicle simply hadn’t been used, so after being allowed to sit in the heat of the trunk, it made for a terrible, moldy, stinking surprise! Thankfully he was experienced in detailing and managed to clean the car back to normal, despite the awful stench it had provided before. We know messes can come from all sorts of sources, including our need to eat and drink. That’s why Onsite Detail’s Interior Detail is so popular for spills, stains, smells and sticky situations. Give us a call today or fill out a Request Form to take care of your mess now!